As a native Texas Mexican, I was delighted to encounter the authentic, iconic, Spanish pasta dish, fideo, on a recent visit to Chef Luis Roger’s BCN restaurant in Houston. I took the first bite and it immediately brought up memories of another authentic, iconic fideo, one that my mother served in our home in San Antonio and that is served in every Texas Mexican home that I’ve ever known, Mexican fideo. BCN was an experience of both taste and history. The taste of Chef Roger’s fideo was familiar to me, and also foreign, fusing as it does, native with foreign ingredients. It conjured up Houston-Galveston’s fascinating part in the history of Spain’s encounter with Mexico. An encounter that would change the taste of their traditional foods. connected Chef Roger’s fideo with my mom’s. Tomato-onion is a uniquely Mexican flavor that enters Spanish cooking in the sixteenth century. When Spaniards occupied Mexico and first laid eyes on tomatoes, the red fruits were domesticated, plentiful, and used widely in native Mexican cooking. When they were exported to Spain, tomatoes were at first misunderstood and even reviled as satanic, but they eventually were loved and adopted by Spanish cooks. 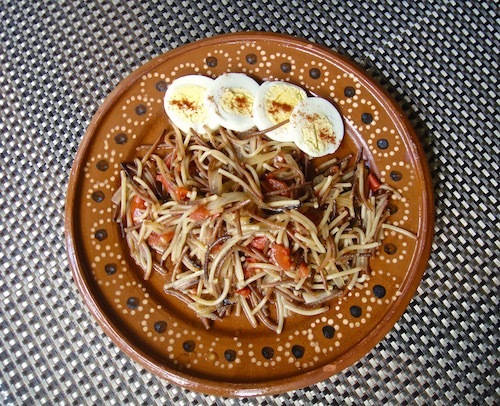 Just so, Mexican cooks adopted the Spanish imported vermicelli, and now fideo is considered an authentic Mexican dish. Fideo tells the story of two cultures clashing, collaborating and changing. The Galveston-Houston part of that story began with a shipwreck rescue. provinces” on the western and northern coast of the Gulf of Mexico. Along the way, the 600 men dwindled to 80 as a result of crew desertions, deadly storms, and armed resistance from natives who lived on the coast and who were intent on protecting their homes from invasion. Much about the customs and culture of the Karankawa people has been erased, so it’s not surprising that Chef Roger was unaware of them, and also of the help they gave to his Spanish predecessors of long ago. But the Karankawa people nonetheless are the precursors of today’s Houston-Galveston communities. They demonstrated hospitality, as they fed the crew an array of fish, seafood and roots. They built fires to warm them, and then carried them, holding them tightly, all the way to their homes. The Karankawa homes were made of poles, brush and hides, designed to be disassembled easily when the community moved from the coastal estuaries to the inland coastal prairies where, with the change in seasons, food sources were more readily available. history and culinary ideas, and I felt we were connected through food that was both his and mine. Simultaneously foreign and indigenous. Karankawa served meals in earthenware. In addition to being expert fishermen and hunters, the coastal people were also inventive pottery makers. Their decorative style is known as Rockport pottery. Artisans made bottles for water, beakers and wide mouthed jars of all types. They made small and large bowls for cooking and serving the food that saved the starving men in 1528. Just a few years earlier, in 1521, another Spanish conqueror, Hernán Cortés had captured the city of Tenochtitlan, the current Mexico City. His victory initiated the full momentum of colonization and its expansion into Texas. The indigenous peoples of Texas, including the Karankawas, were eventually called Mexicans. In 2014, almost 500 years later, Catalan-born Chef Roger opened his restaurant, and I thought that it was a kind of second coming of Spain into Galveston-Houston. This time the encounter was not one of conquest but of hospitality. 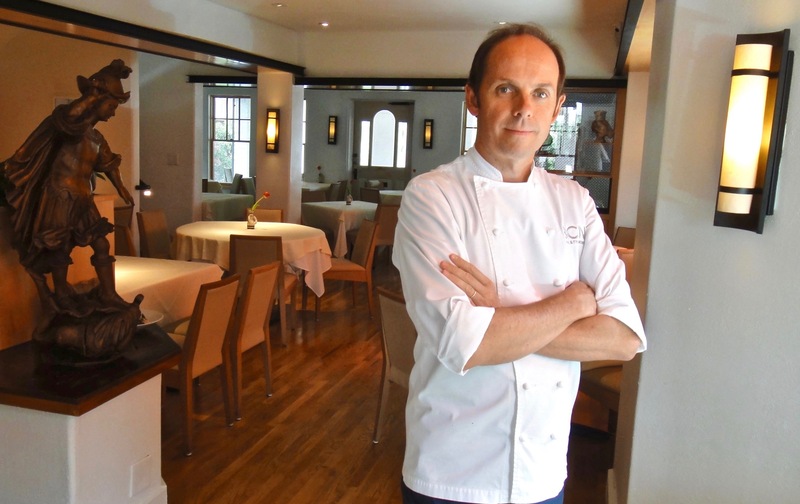 “Es muy importante,” says Chef Roger about hospitality in dining. Houston’s BCN restaurant is at once traditional and cutting edge, an admixture of Spain’s traditions, evocative of grandma and granddad, with new flavors influenced by Ferrán Adria of El Bulli fame. Demonstrating his training at El Bulli, Chef Roger’s bold menu offers beet foam on cucumber tartare, and duck tongue confit. These are alongside the roasted fideo item. 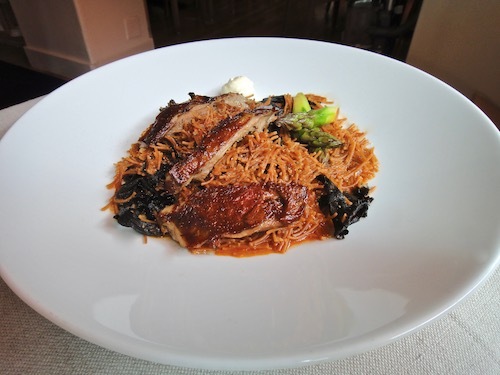 The fideo follows the traditional style of cooking Chef Roger learned from his grandmother on his mother’s side and his grandfather from his father’s side. “Although they weren’t trained as professional cooks, they were, nevertheless, great, masterful cooks,” he says. The broth for the fideo begins with a slow caramelization of tomatoes, onions and leeks. Chef Roger makes a soup from this base, adding cinnamon and cloves. He also adds Iberian pork that, since 2014, is now farmed in Texas. Operating Houston’s premier showcase of Spain’s cuisine, Chef Roger dresses up the fideo with slices of pork cooked “a la plancha,” (on a griddle) and sumptuous porcini and black trumpet mushrooms, drizzled with truffle oil. His fideo is irresistible. tender. That is true home-style fine dining. 1. In a molcajete or other mortar, mash the black pepper, garlic, salt, and cumin into a fine paste. Set aside. 2. In a large sauté pan, heat the oil and sauté the vermicelli until it acquires some golden color, about 2 minutes. Add the onion and continue cooking until the onion is translucent. is cooked and the liquid is reduced. Taste and adjust the salt. 4. Slice the hard-boiled eggs and place them atop the fideo. This story was first published in Houston Press, 2018.